To be honest I’m just impressed that only once did I have to double up on my writing during this 31 day challenge. I’ve been motivated to share what we’ve been learning and track our experience. I really can’t believe that we’re only just a couple days from the end. Today started off a little rough as I needed to fill a prescription and it took a lot of extra time… But in the end my time with my mom’s group and growing in the Lord always helps! We are reading the book “anything” by Jennie Allen and it is life-changing. I think there’s a reason why I’m reading her book while doing this challenge. Then I was able to head to Safeway to pick up my prescription which thankfully had no co-pay! And then the boys were able to use their banana cards at Safeway to each get a free banana and we stopped by the bakery for a free cookie. A double whammy! The kids got to wear their costumes to moms group today, which was extra special because the care workers even took their photos. Super fun. Then after lunch the boys headed for a nap and I worked my tail off around the house. Prepping for our small group tonight which was a little bit of a birthday dinner for Ben, and one of the little boys in our group who share a Halloween birthday. We had one of our favorite meals Japanese curry and all the group members contributed so we were able to spend zero! Thanks to the group members who provided ingredients, helped cook, and even brought Ben’s favorite dessert. Also I did a small craft with the boys that I’ll write more about later. Another spending zero thing. In a month full of special events this was a big worry for me. I worried about birthdays, gifts, parties, and blessing others the way we like to do normally. What I’ve learned is that doing something within your means, from the heart, and even sometimes for free can be more meaningful. Small group is always a wonderful time and especially challenging. But tonight one of our group members had the idea to go around the circle and explain what they love about Ben as their birthday gift to him. What a beautiful thing! She didn’t know it but this has been a family tradition at his house in years past so it was especially significant to have our “friends who are family” carry on this tradition for Ben. And I was amazed at how well they truly know him. They love all the things that I love most about my incredible man. I am oh so grateful for the ways friends have blessed me with both advice, input and even some low-carb contributions to my refrigerator nearing the end of this spending zero challenge. Here’s a wee glimpse at my evening meal/snack. Can you say protein? 1. Thanks to our awesome small group Ben had a wonderful birthday dinner that included his favorite dessert, drinks, and I just contributed some ingredients to dinner and a pot of rice. All things I had! Plus I made that wee birthday banner (albeit a bit dorky) from what we had at home. 2. We ate all our meals from home. Which still feels like a big victory to me! A lot of times after moms group I would load the boys in and we would do some kind of drive-through just because after we tear down and clean up it gets late and it’s easier to just do that… But instead I came home they played outside and help me a little bit around the house while I made their lunch and it was OK that they got to their naps a little bit later than normal. 3. The boys got bananas and cookies at Safeway for free! 1. Use what you learn. Don’t go back to old habits. Let me tell you I’ve already been tempted. And it’s super easy. But I’m planning to sit down and re examine our budget and remind myself about how much we saved this month! 2. Be grateful and accept help. We are all needier in certain times of our lives and we all have the opportunity to be the generous ones… Pay Attention, be attentive to the needs of people around you no matter which side of that spectrum you fall on. Read the other posts in the “Spending Zero Challenge” and learn more about what this journey has taught me. 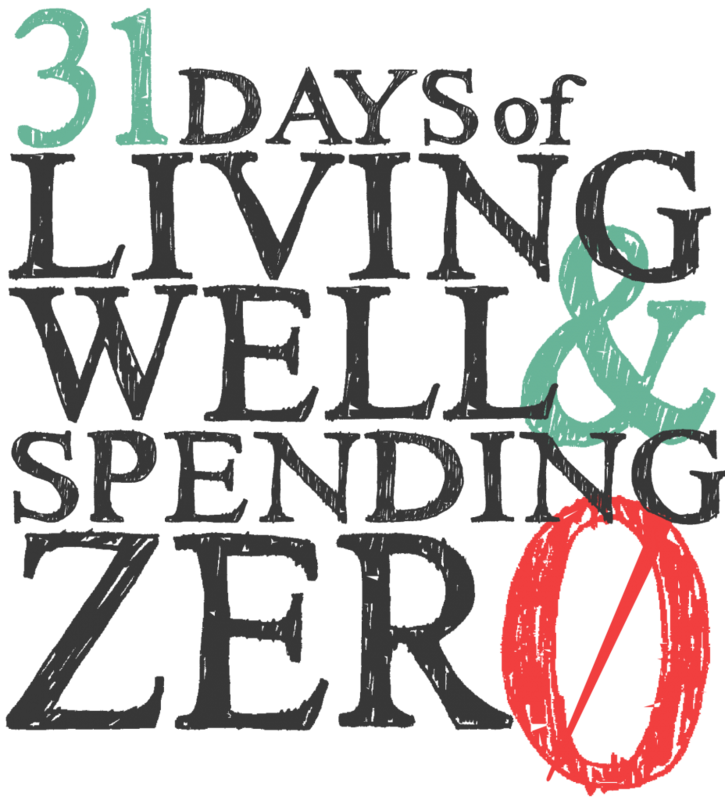 31 Days of Living Well and Spending Zero has changed my life.